Book Scope, Online Book Shop- Cutting edge books on crime, conspiracy, society and the big picture! The online bookstore for independent publishing company Creative Research. Featuring controversial and previously banned books written by investigative journalist Avon Lovell. Based in Perth, Western Australia there is now a convenient online or mail-order service - so you can choose which you prefer. The plan is to make these texts available to everybody, even lawyers. To view our our news headlines click here. Need to contact us for any reason, here is the page for you. W.A. Justice system agrees that there is now no impediment to sales of the books. Bookshop. Courts globally reconsider the infallability of and reliance upon certain forensic evidence. Avon Lovell would like to thank his many and varied supporters throughout the years. I'm tempted to say you should buy this book before it's taken off the shelves. Really, you should just read Litany of Lies because it's important. Because, as they say, it was all done in your name. [Lovell’s] commitment, his deep level of research and personal sacrifices for the sake of the truths behind the [Mickelberg] convictions are without precedent in WA journalism, if not nationally. 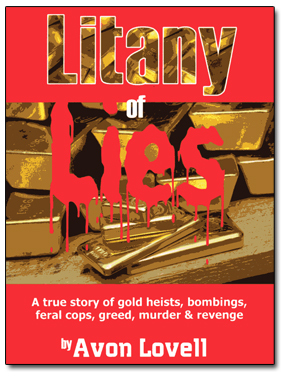 Litany of Lies includes portions of Lovell's earlier works, but it's not a proper substitute for The Mickelberg Stitch, which is an Australian crime classic and remains essential reading. The isolated gold mining town was owned by a former ranking cop, Don Hancock. He had the pub, the race track, the general store, caravan park and a gold ore crusher. Hancock earned millions in illicit gold when he was Western Australia's most senior detective. He owned a gold mine, race horses, properties and a large share portfolio in gold ventures. He also received regular cash from prostitutes for his protection. He was the State's foremost cop, and foremost corrupt cop. His reputation was based on an infamous sting on the Royal Mint, Perth. Bullion worth (in today's money) about $2.9m was extracted by a cunning thief using only a telephone. No witnesses, no violence, no victim. An extraordinary crime that was solved by Don Hancock, delivering up three brothers, Brian, Peter and Ray Mickelberg, who copped lengthy sentences. Lovell's first book, The Mickelberg Stitch, detailed a forged fingerprint, false confessions and a sham sketch of a suspect. The book was swiftly banned on police applications. His second book, Split Image, did not even hit the streets because of police and Crown threats to booksellers. The book they tried to ban! In 1982 an ingenious swindle at the Royal Perth Mint netted a fortune in gold bullion. Police focused in on the Mickelberg brothers, Ray, Peter and Brian who were sentenced respectively to 20, 16 and 12 years gaol. - unsigned `confessions' - fabrications, omissions - and a forged fingerprint! Now the Mickelbergs are after their persecutors. Avon Lovell's documented expose of an Australian courtroom Watergate is a triumph of investigative writing. Global quest for justice and the preservation of basic human rights with a focus on how a 'guilty' verdict can be assured via the omission, destruction and fabrication of vital evidence by authorities desperate for a conviction. When the Perth Royal Mint had over $650,000 in gold bars stolen on one day, amid a string of similar bullion-related crimes, investigating detectives were under intense pressure to conclude the case quickly. The suspicion that police had framed the suspects grew stronger and as evidence mounted, high-level governmental authorities colluded to cover it up...and protect the 'infallability' of forensic methods in courtrooms around the world. In the chill of night at an outback campfire a first shot misses a Gypsy Joker bikie. Five minutes pass and the cool-headed gunman fires again. Billy Grierson, is dead, shot in the back. It is an isolated cowboy town in the middle of the Australian bush, a gold mining hamlet owned by a former head of the WA Criminal Investigation Branch [CIB], Don Hancock. He has the pub, the race track, the general store, caravan park and an ore crusher. He is the 'mayor' of Ora Banda. Hancock was always in the gold, earning millions as a dealer in illicit gold when he was the State's most senior detective. He owned his own gold mine and had race horses, properties and large share portfolios in gold ventures. He also owned (silently) hotels and received regular cash from prostitutes and other businesses seeking his protection. He was the States foremost cop, and foremost corrupt cop. His reputation as a detective was entirely based on the Perth Mint Swindle in which bullion worth (in today's money) about $2.9m was extracted by a cunning thief using only a telephone, a false name, rented offices and some stolen cheque blanks. On the presentation of three false cheques, the Mint meekly delivered up its bullion to the thief's courier. No witnesses, no violence, no victim. An extraordinary crime, solved by Don Hancock who delivered up the three Mickelberg brothers, Brian, Peter and Ray. They copped sentences of 12, 16 and 20 years respectively. Lovell writes the first book, The Mickelberg Stitch. He details the areas of fabricated evidence, principally a forged fingerprint, fabricated confession and sham police sketches of a suspect traced from photographs. He was sued vigorously by various police, the first cab off the rank being Sergeant Tony Lewandowski who, with Hancock, was alleged by Lovell to have fabricated the confessional statements of the three brothers. Eleven years later, some 100 court cases and over 1,200 court appearances under the belt, the police paid Lovell $250,000 to settle the actions. The price had been high. A marriage breakdown, threats, onerous court costs, brief stints in jail whilst exposing Hancock's business dealings. The Stitch was killed from the market after one week. The second book, Split Image, out in 1990, did not even hit the streets because of threats from the Crown by way of the principal prosecutor, John McKechnie, now Justice McKechnie. Then, in 2002, Lovell held a series of interviews with his old bete noire, Tony Lewandowski, a private detective since 1989. Lewandowski revealed to Lovell the true story of how he and Hancock fabricated the Mickelberg confessions in their entirety. Why was Lewie talking to Lovell? A few weeks after the murder of Billy Grierson, the town of Ora Banda was blown to pieces, presumably by the bikies. The general store, the pub, the old settlers house owned by Hancock and the gold ore crusher through which Hancock ran stolen gold which he had bought with the cash earnings from prostitution: a brilliant laundering operation. On 1 September 2001, Don Hancock was blown to bits by a car bomb triggered remotely by cell phone. The State failed to investigate the death of Billy Grierson, and, as in the olden Wild West, it is deemed that the Gypsy Jokers had taken the law into their own hands. Hancock was the holder of the Black Scroll, his secret book of dirty dealings throughout the State's last 30 years including politicians, lawyers, judges and top cops. He had hired the States top crooked QC, who ran protection on him. The State was afraid to investigate Hancock. Indeed, it may well have been crooked coppers or worried business associates who arranged for his death because they feared exposure if Hancock had been charged with murder and ratted them out to avoid jail - the equivalent to a death sentence to such a man - either way! Lovell finally acquired a stunning affidavit from Lewandowski, which was presented to the State as the basis for an appeal to quash the convictions of the Mickelbergs. To avoid his witness from being assassinated, he sent Lewandowski to Thailand with several bodyguards where he drank, screwed and ran general riot to the despair of his watchers. Lewandowski described his last conversations with Hancock before he was killed. Yes, he believes that Hancock killed Grierson. The State Coroner found that Hancock was the only suspect. He got away with murder. The State condoned the crime to protect its precious structure, its corrupt structure. The State and its Attorney General wanted to bury the case. Lovell was called before a Royal Commission into Police Corruption - a vehicle for suppression rather than reform. He refused to co-operate and was arrested on the AG's certificate on charges of contempt. It appeared he was to go to jail, for telling the truth! For revealing police corruption! For writing a book! He was taken to the Supreme Court cells, adding to previous trips to the main tank at the District Court (twice), East Perth Lockup (twice), Fremantle Jail (in transit cell only) and to the main remand centre at Canning Vale Jail. In 2004 the convictions of the Mickelberg brothers were quashed upon the perjured and fabricated evidence as exposed in The Mickelberg Stitch and Split Image so many years ago. Lewandowski had committed suicide just two months before the decision. No police officer has ever been charged with criminal offences because the State had an unpublished but firmly positioned policy NOT to charge police officers with criminal offences once they had retired. Accordingly, numerous errant officers resigned just days or, in one instance, just hours before impending charges were to be laid. Over the span of 25 years Avon Lovell has been involved in nearly 100 actions at law making a plethora of court appearances in person as he could not afford legal representation. He has taken prerogative writs, a multitude of technical attacks and has sued Australia at the United Nations for breaches of his human rights. He lost, but it was a damn good run! But Lovell has a second affidavit from Tony Lewandowski that detailed the systematic and deliberate abuse of every court in the Civil Jurisdiction with perjured and fabricated evidence to suppress the facts revealed in his books. "We were amazed at what we got away with in the Courts," Lewandowski said. The police purpose was never to go to trial against Lovell but to drive him into bankruptcy or force him to leave Australia. And for over 20 years the Police Union has had a special levy on each of its 5,000 members of $2 a week - to fight Avon Lovell! It was all a Litany of Lies.